We hav packed up just now!at 1 am!but @iamsrk n @bomanirani who had wrapped at 8.30pm STILL in van playing PS4..kya dedication hain! Thanks Kiran. I've posted a couple of others like this in the 'Tweets about HNY' thread... but I don't want to move this one cause the thread will be gone too. Which we need. So would you mind posting it there too? Thanks! sounds like that Vanity Van is a bit too cosy! @ifaridoon @iamsrk @mandvisharma is the best person to answer that question sir ! Wish you a very happy new year in advance! Maryah, SRKFanatic, you guys probably need to reach out to @srkin2014 as they are seeking participation from SRK fan clubs. Reminder for all @iamsrk fans... Lets all come together at 6:00 PM IST to trend #In2013SRKTaughtUs and share our experiences! CHEERS! The 15th Annual Calendar of @dabbooratnani will be launched on Sunday Jan 5th...biggest of celebs expected! 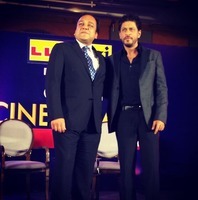 Shooting with someone I admire the most @iamsrk. Just listening to him enlightens you so much. Posted on Facebook... not yet verified. SRK @iamsrk & Hrithik @ihrithik Coming Together In Final Episode Of #KWK At 16th March 2014. 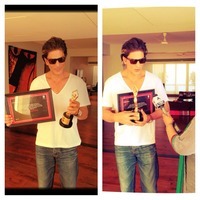 Tomo Jan 9 evening @iamsrk will be the main attraction at the Press Con of Zee Cine Awards in Mumbai. The celebrities. The fashion. Shah Rukh Khan. Retweet if you can’t wait to watch the #ScreenAwards2014 tomorrow! Was privy to an interaction between @iamsrk and Mohit Raina aka Mahadev at LIfeOKScreen rehearsals, totally out of this world experience.. In a tiny village in Laos I am worthy of an autograph because I come from India, the same country as @iamsrk ! How marvellous is that ? Today in the #ScreenAwards, Red Chillies is nominated in two categories - Best Marketing and Best VFX Fingers crossed!!! Hope we win!! #SRK is absolutely fine. Please stop spreading false news. @iamsrk is totally fine. Please don't spread false news or rumours about his health. He is getting ready for @screenindia Awards! The special effects that blew our minds! Red Chillies bag the award for the Best VFX at the #LifeOKScreenAwards.